Great for electronics, camera equipment, and much more! 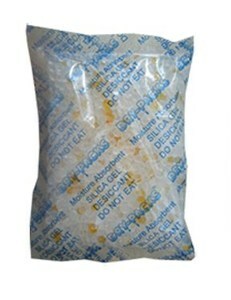 Eliminate moisture damage in small enclosed spaces with these handy 1 ounce silica gel packets. 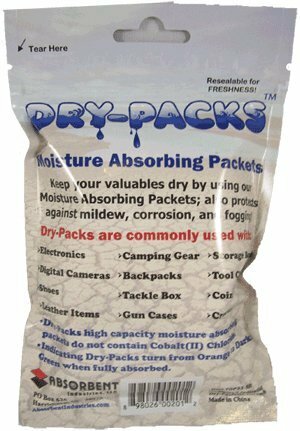 You will receive five 1-ounce packs in an air-tight aluminum moisture barrier bag that can be zip-locked to keep the unused packets dry and ready to use. 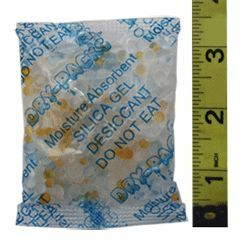 The see-through silica gel packs have indicating gel that turns from orange to dark green when fully absorbed to let you know they're full of moisture. Ideally sized for many uses: camera gear, scuba gear, electronics, photo albums, jewelry, leather goods, camping gear, gun cases, ammo boxes tackle boxes, tool boxes, coin collections, stamp collections and other collectibles. You will receive five 1-ounce packets. Each packet measures approximately 3-1/2" x 2-1/2" and will cover an area of approximately 2 cubic feet (length x width x height) of enclosed space. For larger volumes, you can add more packets or purchase a larger unit of silica gel.